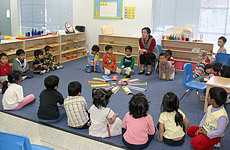 We offer Montessori based preschool programs for toddlers (18 months) up to Kindergarten ages. Note: Newark-Birch, Pleasanton-Bernal and Elk Grove campuses offer programs for 2 years up to Kindergarten entry only. We offer full-day programs that are five, three or two days a week. Half-day programs are offered at our Learning Center. Full-day programs are from 8:00am to 6:00pm. Extended care hours are available from 7:00am to 6:30pm. We provide snacks and hot lunch all programs for no additional charge. Click here for a sample menu. Copyright © 2006 - 2019 Little Flowers Montessori, Inc. All Rights Reserved.